RPVT Counselling 2018 – The Rajasthan University of Veterinary and Animal Sciences (RAJUVAS), Bikaner has announced the notification of RAJUVAS RPVT Counselling for providing admission in B.V.Sc and A.H courses. All the eligible candidates who successfully qualified RPVT 2018 must attend the counselling session. Applicants can now get here RPVT Counselling Dates along with the complete details of procedure. The RAJUVAS B.VSC Admission along with the admission of other courses is completely done on merit basis and thus the physical presence of the candidate at the time of counselling is mandatory. In terms of more detail, check the article below. The Rajasthan University of Veterinary and Animal Sciences conducts the RPVT test every year and therefore candidates whose name appears in RPVT Merit List must further attend the counselling session. The RPVT Online Counselling 2018 is tentatively going to be conducted in the month of July. 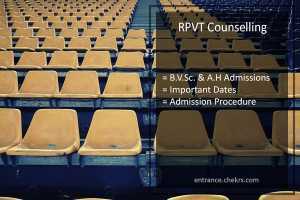 Therefore who are seeking for admissions in B.V.Sc & A.H course must go through RPVT Counselling Procedure which includes a number of subsequent rounds such as registration, choice filling, fee payment. document verification etc. Below you can check the details of RPVT Counselling Schedule as discussed below. Applicants must go through the below-mentioned process at the time of counselling. If any candidate does not participate in the counselling as per scheduled then his/ her admission will be cancelled. Candidates must make payment of the fee as mentioned below. After the declaration of result, the university is going to conduct RPVT Counselling 2018 for allotment of seats in B.V.Sc and A.H courses. The candidates will be allotted their seat on the basis of choice, rank on the merit list, category and as per availability. The authority will declare RPVT Seat Allotment Result through its portal and we will also update you here with the same.